Satan | Build Your Walls! Guard Your Gates! A man walked into a pawnshop and went straight to a worn down piece of furniture hidden in the back of the store. He moved several other items that had been stacked against it and stepped back to take a look. 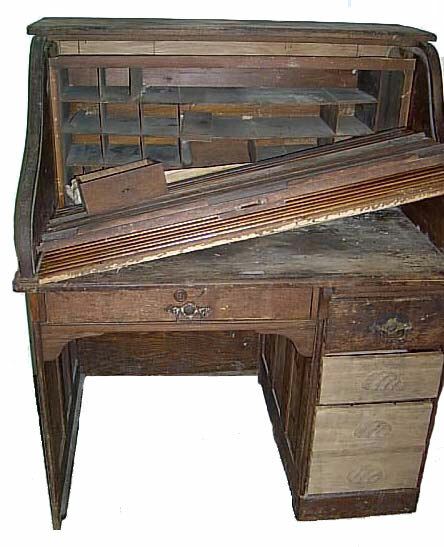 The piece of furniture was once a beautiful writing desk made with fine craftsmanship, but the former beauty had been worn away through years of use as it served first one family and then another. These years were followed by even more years of disuse after it had been left out on the curb and salvaged by the pawnshop owner. It was no longer beautiful. Its drawers were broken, its roll-top in splinters, its feet uneven and wobbly, its stain faded and surface scratched and dented. Looking at it, it was hard to imagine what the piece had looked originally. You certainly wouldn’t want it in your home. It was a real eyesore. Even so, the man pulled out the desk and told the shop owner that he wanted to buy it. The shop owner named a price – a surprisingly high price considering the condition of the desk – but the man was willing to pay it, and the transaction was made. The man loaded the desk in his truck and took it home, where he placed it in his garage. He turned on the overhead light and gave the desk a thorough inspection. He took note of the broken drawers, the splintered roll-top, the wobbly feet and the scarred surface. Nothing escaped his trained eye. Having completed his assessment, he mentally planned what repairs and improvements would need to be done. Then, he turned off the light and headed to bed. Tomorrow would be soon enough to begin the work. The next day, the man arrived late in the afternoon with new lumber and a collection of well-worn tools. He was a carpenter, and these were the tools of his trade. He had begun and finished many projects before this one, and he would begin and finish many more. The work thrilled him. It was a labor of love, and he thoroughly enjoyed taking something discarded and bringing out its true value. With a smile of anticipation and a clear vision of the finished product, the man turned the desk on its side and sawed a heart-shaped piece from the bottom panel. He then replaced it with a custom-made heart piece – golden in color with intricate etchings and made from a fine wood. It was on the bottom panel, where it was unlikely that anyone would see it but him, but it was his trademark and showed the love and care he put into refurbishing the piece. Those familiar with his work knew where to look for his signature. He turned the desk back up and began with structural repairs. He replaced one of the feet, repaired the broken drawers and built a new roll-top. Before long, evening arrived. The man put away his tools and retired for the night. The next day, he returned to his work. Using a sanding block, he began working on the inner parts of the desk that no one typically saw. This might have seemed like a waste to most, but again, this was his trademark. He always began from the inside and worked his way out. After a week, an observer might not have seen much difference, but the man knew how smooth the inner boards had become, how silently the drawers slid in and out, how strong the joints and the frame had become. It was a work of quality he was engaged in – not a work of speed. He was not concerned about turning a quick profit; he wanted the finished product to be a blessing to some family who needed it. He wanted it to bring them joy for years and years to come. He thought about the children and the grandchildren who would live life around this desk, and he wanted the changes he made to bless generations. When he was done with the inner parts, he began work on the outer, and the piece began to really transform. Each board was smoothed to take away the abuses of the past. But he didn’t remove every dent or every scar. Some, he knew, added value to the piece and gave it character. Still, even these blemishes received his painstaking attention. In fact, he spent more time on them than he did on the smoother parts, and when he was done, they became the most interesting parts of the whole piece. What was ugly became beautiful and interesting, and those who saw them would want to know more. When everything was prepared and the dust and grit and stains of past years had been removed, the man applied a covering. It was a deep, reddish stain that soaked into the wood and provided a protective finish. It was such a unique color that those who knew recognized it as the work of the man whenever they saw it. The man then sealed the piece with a clear, protective coat, installed new hardware to the drawers and roll-top and finally stood back to admire his work. The piece was impressive and made you want to come closer to look. Its wood was so smooth that the man could literally see his reflection in it. He smiled and said a quick, “well done!” to himself. It was good. In fact, it looked even better now than the day he originally created it. You see, the pawnshop owner thought he was taking advantage of the man when he sold the desk at such a high price, but the man always knew the quality of the workmanship, because he had made it himself many years before. Years of abuse and neglect had all but ruined the desk, but the man trusted in his own unique ability to restore the piece – even to make it better than before. So he paid the high price, and he had no regrets. Looking at the restored work, he knew exactly who he was going to give it to – a gift for a family that he dearly loved. A few years ago, a documentary movie called “March of the Penguins,” was released. If you haven’t see it, get a copy. It’s a beautifully photographed movie with some interesting metaphors for teams. For example, emperor penguins make a yearly 113 km trek across the ice of the Antarctic in order to mate in the exact place where they were born. Each mother lays a single egg during the coldest time of the Antarctic year, when temperatures can reach as low as -80 F / -62 C. First the mothers and then the fathers take turns incubating the eggs to keep them warm. They do this by resting the egg on top of their feet and covering it with the lower part of their belly. The mothers pass off the eggs to the fathers a few days after they eggs are laid so that they can return the 113 km to the sea for food. (Both fathers and mothers have been without food for about two months at this point.) The fathers then have the responsibility of protecting the eggs during the 62- to 64-day incubation period while the mothers are away. They spend the entire two months standing with the eggs perched on their feet and under their bellies while 160-km-per-hour winds whip around them. While the male emperor penguins can be fairly aggressive animals at other times, they lay their differences aside during the harsh Antarctic winter. Thousands upon thousands of fathers huddle closely together to protect themselves and their eggs from the cold and the wind. As the days pass, they take turns rotating to the warmest spots at the center of the huddle. With this unified strategy, the fathers are able to protect most of the eggs until they hatch just a day or two before the mothers return with food. The partnership of the mother-father team is incredible, but what really impressed me was the fathers’ teamwork. Instinctively they know that trying to weather the winter storms individually will lead to disaster, so they combine their resources (in this case, their body heat) for the good of the colony. Nothing seems to bring a team together more than a common goal or a common threat. The penguins’ common goal was survival of the colony. Their common threat was the difficult Antarctic winter. When a team is faced with a cause that they can rally behind, they set aside their personal differences and focus on the task at hand. b) Identifying a threat or enemy that everyone on the team can get enthusiastic about beating. Sometimes the threat you identify is a thing (like sin, poverty or even tasks that are pulling you away from your main priorities). Sometimes it is a negative consequence (like losing funding, having to put restrictions on a project or being unprepared for an event). And sometimes, it’s a person or group (like Satan and his armies). Whatever threat you identify, it has to be something that most or all of the team members feel is worth beating or preventing. Teams that are focused on personal differences are not focusing on team goals. If your team is slipping into this trap, start looking for something everyone can get excited about. A friend of mine shared this story recently. My friend is part Samoan and part Hawaiian. He was born in Hawaii but moved to Samoa during his childhood. Adjusting to the new cultures in this high-context society was difficult for his brother and him, but they made a friend in one of the locals. Their friend, as it turns out, was the son of the High Chief. We might expect the son of a high-class family in power to be arrogant and dismissive of foreign-born, mixed race kids who were new to the area, but he was anything but. He was friendly and took a personal interest in helping my friend and his brother adjust. He taught them local customs, like cooking the family meal on hot stones outdoors every Sunday. He taught them local culture, like the need to show respect for elders. He taught them the local language, and he helped them to fit in. He was a good and faithful friend. One day, the town drunk appeared as the three boys were playing outdoors. Children knew him to be a violent and abusive man, and they avoided him whenever possible, but today, he caught the boys by surprise. My friend could tell he was drunk again, and he could see the rage in his eyes. This day, he had come for the two foreign-born boys. But just as he moved to attack them, the son of the High Chief stepped between his friends and the man. The man’s anger snapped, and he began to beat the boy mercilessly. Several times, he knocked the boy to the ground, but each time, the boy would stand again, blocking the way to his friends. My friend and his brother asked each time he fell if they should go for help. Should they go to get the townspeople, who would come and rescue their friend, the son of their High Chief? The townspeople wouldn’t allow such a crime to happen to their leader’s family. In fact, they might have even killed the drunken man for what he had done. But each time, the answer was, ‘No,’ and the boy would stand again to take the beating. The boys couldn’t have asked for a clearer picture. Their friend, knowingly or not, had shown them an image of what Jesus Christ did for each of us when He went to the cross. He stood between us and the evil one, who wanted to hurt us. He took the beating that was meant for us. Had Jesus wanted, legions of angels would have come to His rescue, yet he refused to call for them. Each insult, each beating, each whip of the lash, each thorn of the crown He accepted as an act of love for us. And each time He fell on the road to Golgotha, He stood again. His purpose was set; His mind was determined; no matter the cost, He would stand in the gap for us, because This is what it means to be the Son of the High Chief. He went on to explain that I was jerking the pedals in a very inconsistent pattern. They key to burning calories efficiently and without injury is having a smooth, consistent motion at a relatively swift pace (more than 50-60 revolutions per minute). Honestly, I haven’t thought about his advice much since then. I rarely get on a bike. (Who has the time?) But I thought about it this morning as I was walking back from taking the kids to school. My life is often an off-balance, inconsistent, jerking-the-pedals kind of mess. I’ve always prided myself in being a spontaneous, hands-off-the-handlebars kind of person (INFP for those of you who are familiar with Myers-Briggs). I hate to be scheduled; I hate routine; I like to stay up to all hours of the night…I just love the enormous possibility of a day free from obligations. But as the years have gone by (I’m 39), living la vida loca is starting to take its toll in repetitive stress injuries. My body now pays triple what it used to cost me to stay up past midnight. I never feel like exercising. I’m always tired. I’m hopelessly behind on my to-do list, and my spiritual disciplines are somewhat undisciplined. I find that I’m always trying to play catch-up….in my finances, in my relationships, in my work, in my spiritual life…so I take the turns of life at breakneck speeds and load my bicycle down with all kinds of good intentions. Then every once in a while, I crash with an illness that lays me out until my body can repair the damage I’ve done. This is no way for a mature, father of three and husband of one to live. So, what occurred to me as I walked home this morning is that I need to find my cadence. In other words, I need to find the rhythm and the pace that I can sustain long-term, and I need to stick to it. I’ve been making half-hearted efforts at this for years, but I’ve lacked the discipline to keep it up and I’m pretty sure that Satan has been doing his best to interrupt my cadence whenever possible by throwing hazards on the road right before I get there. The key to this working, I’ve realized, is that I need to select a lower gear. I’m wearing myself out trying to pedal at top speed in a gear that’s too hard for me. I need to stop trying to do so much that I’m always behind. I need to forgive myself for what I didn’t accomplish yesterday. I need to stop trying to catch up and just start fresh wherever I’m at. Most of all, I need to listen to the messages my body is sending me and get more sleep so that I’ll have the energy to handle whatever challenges the day brings. Rhythm and rest. This is more journal than blog. My apologies. Hope that maybe it helps you find your own cadence. I’m using the word “fortunate” in a relative sense. Those with a visible handicap are potentially more fortunate than those with invisible handicaps, because having a visible handicap forces you to deal with it. People know about it. They make comments about it or joke about it or tease you about it. Kids on playgrounds get picked on about it. Most get treated differently because of it. But as counter intuitive as this sounds, public reaction/response to a handicap can be a gift, because it elicits a response from us. We either become bitter, or we become better. Think of some of the inspirational people you know of who achieved great things despite their handicap. Theodore Roosevelt, Leonardo da Vinci, Aristotle and Michelangelo all suffered from epilepsy. Helen Keller, Harriet Tubman, Claude Monet and Louis Braille were all visually impaired. Tiger Woods, Jimmy Stewart, Moses and Aesop all had or have speech impediments. Joni Eareckson Tada, Franklin Delano Roosevelt and Itzhak Perlman are/were all in wheelchairs. Howie Mandel, David Beckham and Donald Trump all struggle with OCD. I propose that the success these people enjoy(ed) in their chosen line of work/ministry is connected to their disability. In dealing with their handicap, they developed strength, resolve, patience, faith, compassion, trust, perseverance, confidence, maturity, wisdom or any number of other positive coping mechanisms. Their handicap was the grain of sand in they oyster that produced the pearl. Granted, many deal with their disability poorly. They become resentful or insecure. Angry or depressed. Discouraged or defeated. Some retreat into the shadows to avoid the pain of public disdain. Some lash out and try to inflict as much damage as possible. Hurt people hurt people. These are tragic stories, but we should recognize that there was choice involved. No one forced these people to choose bitter instead of better. Many have suffered with the same limitations and chosen to “prove the world wrong” or to “show what I can do despite this challenge.” In life, it’s less import what hand we are dealt and more important what we do with the hand we are dealt. For everyone with a visible handicap, there must be dozens of us with handicaps that no one can see. They are wounds on the inside or detrimental ways of thinking. They are experiences and pains that we’ve hidden far away from view. Because they are not visible, we aren’t forced to deal with them. And because we aren’t forced to deal with them, we usually don’t. But they continue to eat away at us. They continue to influence our decision making. They continue to hold us hostage. There’s not a single person on this earth who isn’t hurting in some way. It’s a result of the sin condition, and it affects us all. Often, the pains on the inside hurt us the most, because pretending that the handicap isn’t there lets it continue to have power over us. Our coping mechanism doesn’t produce a pearl; it produces the neuroses of depression, stress, anxiety, obsessive behaviors, paranoia or fear. The best thing we can do to help ourselves with an invisible handicap is to bring it out into the open. We should quit denying its existence, and expose it to the light of day with a trusted friend or counselor. That begins the healing process. Before long, we will find that God will bring someone else into our life who is struggling with the same disability, and helping that person to heal helps us to heal even faster. Hidden in every handicap, both the visible and the invisible kind, is an invitation and a gift. The handicap invites us to trust God more, to lean on Him, to depend upon Him. If we accept the invitation, we receive the gift. The gift is a tool to shape us more in God’s likeness, to cut away the parts of our heart that are our true disability – our pride and our selfishness. Without the handicap, our self-sufficiency would carry us far from God. When He allows us to be hurt (because even though God is not the author of evil, there is nothing that happens that He is unaware of or powerless to prevent), it is an act of love. God’s purpose in allowing the disability is that we will come to the end of ourselves sooner and return to Him. Give God thanks for your handicap, whatever it might be. Then, let Him use it to bring you closer to Him and to bless the world around you. We almost always call it “The Parable of the Sower,” but the Sower isn’t the key focus of the lesson. The Sower (or farmer) is Jesus in each telling (Mathew 13, Mark 4, Luke 8), and His role doesn’t change. Likewise, the seed he sows/plants doesn’t change. It represents the Word of God in each story. The key focus of the lesson is the soil, and the soil represents our hearts. So, “The Parable of the Hearts” goes like this. Jesus entered His field (the world) and scattered His Word. Literally, He “broadcasted” it (a method of sowing seed), meaning that He sent it out into all directions, so that everything was covered. He didn’t discriminate about where the truth went; He just allowed it to fall where it landed. Hard Hearts – Those who have hearts so hard that nothing could grow in them. Shallow Hearts – Those who have hearts where truth can grow but not flourish, because it can’t go deep. Difficult times make it wither. Choked Hearts – Those who have hearts where truth can grow but not flourish, because worry, fear, comfort, wealth, and desire choke it out. Fertile Hearts – Those who have hearts where truth can grow and flourish. Luke makes it clear that those with Hard Hearts are not saved, but I think a strong case can be made that we will see the rest in heaven. Shallow hearts and Choked Hearts don’t realize their true potential, but the seeds of truth do grow in them for a short period of time. They are like Christians who allow themselves to be deceived by Satan and settle for less than the abundant fruit that Jesus said was possible. Now look at the parable from a different angle. 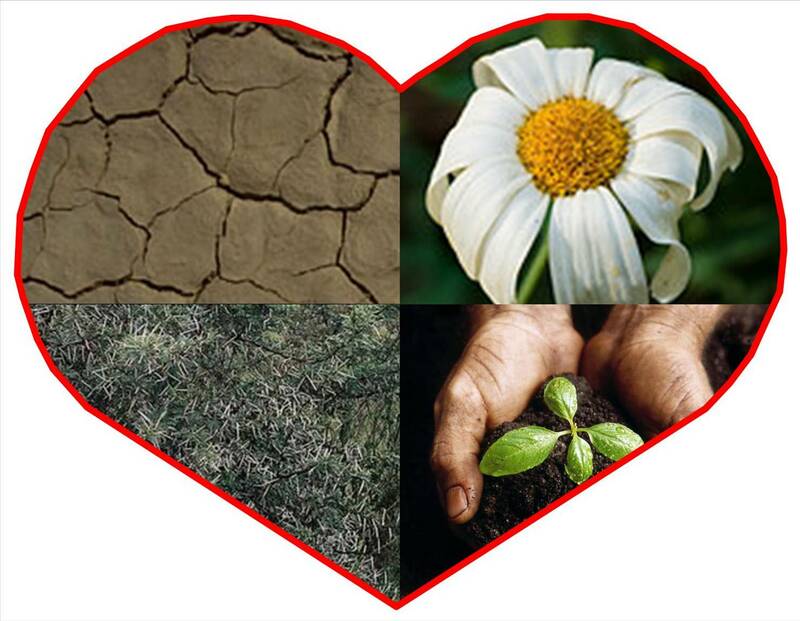 The four types of hearts can really be used to describe just one Christian heart in its different patches of soil. Hard Heart – There are places in my heart that are hard to God’s truth. Like the pathway in the parable, these places have been trampled down by the world. These are the places I’m not yet willing to trust to His care – places of hurt and fear. The seeds of His truth can’t even break the surface, so Satan comes and snatches them away. Shallow Heart – Other places are quick to receive the seed. For example, I may fully agree with my pastor that I should love my neighbor…in principle. As long as I’m not tested in this area, I may seem very godly to those around me. But if my neighbor mistreats me or fails to meet my expectations, God’s truth will wither in the heat of my anger. Fertile Heart – Thank goodness there are also places in my heart where I’ve learned to trust God completely, where He is working to produce an incredible harvest. I’ve got to work hard to keep the weeds out, but if I’ll acknowledge a young weed to the Lord, He will remove it for me. Our hearts are a garden full of different kinds of soil, and daily we are presented with opportunities to let the great Gardener go to work in them. If we will let Him, He will break up the hard soil, clear up the rocks that make the shallow soil shallow, pull the choking weeds and continue to fertilize the areas where the soil is rich and deep. It’s hard work that never ends this side of heaven, but each day, the great Gardener shows up ready to work. All we have to do is to invite Him into the garden.